One of the frustrations of last week was a small 5 year old who didn’t want to be getting ready for school each morning. I made a getting ready chart last week which seemed to help a little, but not as much as I had hoped. So this week I’ll try tackle some strategies (read punishments) for deliberately disobeying. Monday – Miss 5 decided to test the boundaries before school, and ended up losing a few items from her lunchbox. What a great start to the day. Then Miss 9 had to enter a discussion with me about why I always have to hurt her little sister. Boy oh boy. Video editing, finding inspirational quotes, gardening – planting out snow peas, pruning blackberry bushes and attempting to use hormone powder on pruned sections to get some more bushes growing. Fingers crossed it might just work. Tuesday – I had a review with my doctor to handle a bloating complaint and see if we can get a handle on my allergies. Some things to put into place and try, and a suggestion to help with Master 7’s receding gum line, so I spent some time online shopping for the items I needed. Wednesday – I missed getting another massage today, but my shoulder is improving each day and I’m back to stretching it properly again. Thursday – My girls had a moment, well 5 minutes drive time of moments, that resulted in both of them losing something special tomorrow, two somethings. Yes, they were tired, yes they lost self control. But this mummy’s patience has been tested all week, and I was going to stand strong. They deserved their consequence after their behaviour, and I felt justified in dishing it out. Friday – I had a thought. A thought I almost wished I hadn’t thought. A thought that meant I had to do something different, that went against the way I always do things. 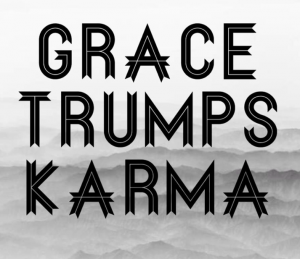 I thought about grace, instead of karma. We had talked about it in church last week, how we usually work on merit, you get what you deserve. And how grace is completely opposite, how you get something good that you don’t deserve. And I felt that I had the perfect opportunity to show my girls grace, that they would understand God’s grace towards them. So I got my phone out, opened up my Bible for Kids app, and we listened to the story about the prodigal son. Remember, the boy who squandered his father’s wealth and then came back begging? And the father, who had every right to dish out punishment, instead gave his son grace, and gave him a robe and had a feast in his honour. After reading the story I told my girls that they didn’t deserve to have their special things given back, but I wanted to show them grace, so they were given their things back. They were surprised, and a little excited, even though I don’t quite think Miss 5 understood. However, Miss 9 seems totally shocked, and genuinely thankful. That’s grace. If you’re interested, see what Bono thinks about grace. Weekend – On the theme of grace, I admitted to a friend that I had wronged them during the week. I expected to be required to offer recompense, to somehow fix how I had wronged them. That somehow by my efforts I could fix the wrong, that I deserved correction and not forgiveness. And they turned around, and freely offered grace.